FLASH FLOOD WATCH REMAINS IN EFFECT THROUGH THIS EVENING The Flash Flood Watch continues for * Portions of southern Connecticut and southeast New York, including the following areas, in southern Connecticut, Northern Middlesex, Northern New Haven, Northern New London, Southern Middlesex, Southern New Haven, and Southern New London. In southeast New York, Northeastern Suffolk, Northwestern Suffolk, Southeastern Suffolk, and Southwestern Suffolk. * Through this evening * Periods of heavy rain can be expected today. Total rainfall amounts will be around 1 inch with locally higher amounts possible. Excessive runoff will be possible which would lead to flooding of urban and poor drainage areas. In addition, smaller rivers and streams could overflow their banks. Ra: "I hope these letters of gratitude and appreciation will bring smiles to their faces." Assemblyman Ed Ra with students from Cherry Lane Elementary School and Susan Folkson, the school’s principal. Long Island, NY - May 22, 2018 - Assemblyman Ed Ra (R-Franklin Square) was pleased to partner with students from the Mineola and Carle Place school districts for his annual Heart for Heroes campaign in honor of Memorial Day. 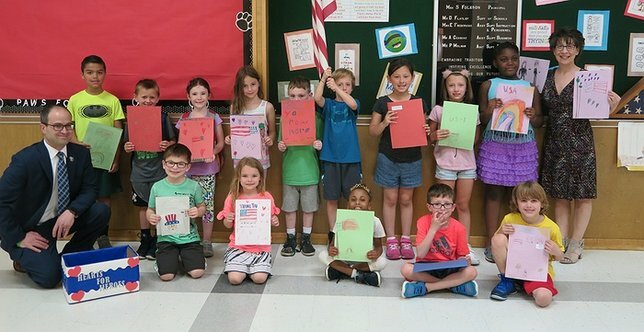 The campaign asked students to write letters thanking active and retired members of the military for their service. Over 500 letters were collected to be included in care packages distributed by Operation Gratitude to U.S. Service Members deployed overseas. Operation Gratitude’s mission is to lift the spirts and morale of our military and first responder communities. Assemblyman Ra represents the 19th Assembly District. Local Elected Officials Assist in Reinstatement of Grant to Alzheimer’s Disease Resource Center, Inc.
Subject: LongIsland.com - Your Name sent you Article details of "Assemblyman Ra and Local Students Send Appreciation Letters to the Military"